A small note: the present expedition «Arctic Sunrise» - part of an international campaign by Greenpeace. This organization offers to ban in the Arctic Ocean beyond the 200-mile economic zones of coastal States any economic activity. The main requirement of environmentalists - to declare the Arctic Region global reserve and with this demand they are going to speak at the September meeting of the UNO General Assembly. To Greenpeace’s opinion, the ecosystems of the Arctic seas are extremely vulnerable, and seemingly harmless at first glance seismic exploring causes serious harm. Acoustic influence negatively affects Arctic marine life: whales, walrus, fishes. It may scare animals, cause diseases and even lead to death. That's why they want to state the value of the work of our Russian vessels and to record sounds of seismic exploring that can be heard underwater by inhabitants of the Arctic seas, for subsequent presentation in the world. The Greens has even started to collect signatures, creating a special web page «Save The Arctic» with a beautiful slogan "The Arctic region is not the place for the oil industry, commercial fishing, and wars." According to the organization’s spokesmen, has already been collected more than one million signatures. I also wanted to leave the signature, but suddenly thought, why exactly now Greenpeace decided to fight with the oil development in the North, is it possible that before no one in the waters associated with the Arctic region, does not produce oil? And then I was enlightened: our neighbors Norwegians have already developed oil and gas for 41 years, but for some reason for them the Greens don’t swim. But about everything in sequence. The vast majority of oil is produced by Norway on offshore fields of the North Sea. The oil sector provides 30 percent of receipt of funds in the budget of Norway. And at the beginning of XXI century, Norway was included into the three largest exporters of oil in the world, along with Saudi Arabia and Russia. It should be noted that, despite the presence of companies in which the Norwegian government owns a majority stakes, a major role in oil production is played by foreign companies from which Norway generates the big income at the expense of heavy taxes. The percent from this money arrives in the stabilization (oil) fund which all means are invested abroad. 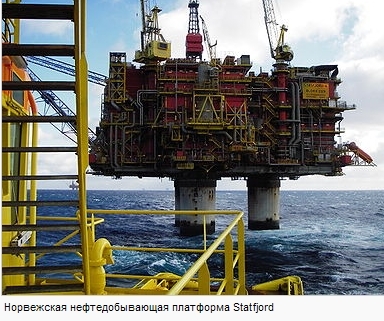 At the moment in Norway development and production of oil, gas and gas condensate on 70 oil and gas fields is carried. Each of them can have dozens of wells and up to 6 drilling rigs. These fields are spread out along the coast of Norway and settle down on the Norwegian continental shelf: in the North, Norwegian and Barents seas at distance about 30-260 km from the coastline. Fact: 81.8 % of the Statoil company belong to the state of Norway. The rest are divided between investors from other countries: the United States has 5.3%, Great Britain - 4.4%, Norway - 4.0%. The rest is distributed between the Benelux and other countries. For people are interested in it is no secret that the oil and gas exports, which is called the raw material, is more than 50% of the all merchandise exports of Norway. The oil and gas industry is the base of the Norwegian economy. And more than a quarter of all Norwegian investments is the share of construction of drilling platforms in the North Sea, to the West from Bergen where one of the most large-scale deposits of natural gas is located. Have you known that it is the Norwegians built the world's largest drilling platform, by a displacement of 1 million tons and a height of 465 m? Fact: Norway: daily level of oil production in the country reaches 3,0 million barrels. And almost all are exported. The most part of black gold of Norway is extracted on offshore fields of the North Sea. It should be noted that, since 70th years, Norway not only realizes investigation, oil and gas production, but also prepares for drilling of the territories to the part which have departed by it «gray zone». 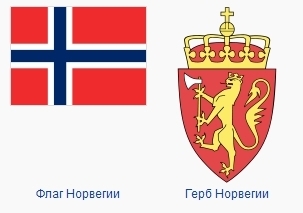 Recall, Russia and Norway signed an agreement on demarcation of sea spaces in the Barents Sea and the Arctic Ocean. So under this contract to the Norwegian transferred the territory rich with hydrocarbons, by approximate calculations it to 5 billion tons of oil, and Norway actively is going to master this territory. The Norwegian Petroleum Directorate has already started geological exploration in this water area which size is about 90 thousand sq.km. "We have begun seismic researches in the eastern part of the Barents Sea, there are views of gas beside of Jan Mayen Island. Besides, some perspective fields are found in the Barents Sea, for example, Skrugard. I am not alarmed by so-called collapse, which supposedly should come after 2020, "- this is what the Deputy Minister of Petroleum and Energy Minister Per Rune Henriksen has said. Fact: The domestic market of Norway is very small. Its production is many respects oriented to the export of resources and the goods as the country consumes only about 5% of gas made at. There is a reasonable question: why Greenpeace does not conduct its environmental work with Norway? It has been long and actively developed offshore fields, and happen on these fields floods or failures, the Arctic and all World Ocean will suffer not less than from hypothetical spills in our fields. By the way, an interesting fact: the equipment used in Norway affects on wildlife as well as ours, Russian, because the equipment we use is the same. The volume of oil and gas production in these areas are not comparable, Norway is the leader on production in the North. But apparently, Greenpeace believes that the Norwegian equipment of seismic investigation has no negative impact on marine life in the Arctic region. Or that all sea inhabitants, having learned, for example, that a part of the territory of Norway withdrew, immediately moved to the Russian zone? Why Greenpeace icebreaker went to the Barents and Pechora Seas for environmental inspection work on oil exploration and oil production which are of "Rosneft" and "Gazprom", but wanted to spit on our northern neighbors? If it comes to that, in Norway, in terms of logic, the vessel must be constantly or at least 4 times a year visit the Norwegian platform with checks. Norway was involved in a fight for the Arctic region. Not that it particularly refuses from this, but the fact of silence and approval during a visit to Norway U.S. Secretary of State Clinton in June of this year, discussing questions of the Arctic region and telling about the leading Arctic region states to have forgotten that the Russian sector of the Arctic in many times more than the American and is more considerable Norwegian speaks about much. Let's not forget the fact that it was announced that the Norwegian fishing town Tromso, neither is a lot of, nor it is not enough is the "capital of the Arctic." There is a question why our tolerant and honest neighbors didn't correct the American guest, and lovely smiled and approvingly nodded? After all for that matter Murmansk has long ago staked out the title of the capital of the Arctic for itself, in addition, it is five times larger than Tromso, here is a well-developed logistics, the industry and a science are strong, education is developed. And I care about such question, why now, during the beginning of the project by the Russian side, instead of during the formation of the oil industry of Norway, Greenpeace has attended marine waters of the Arctic? If that, for what the Greenpeace appears, will come true, we not only will lose access to huge inventories of oil and gas that are in a shelf of the Barents Sea, we will restrict the movement of vessels, we will lose the Northern Sea Route, to us will forbid fishery. No one in the world, except Russia, is not profitable, so we started to develop those reserves of oil and gas that are in our Arctic territory. And if to solve a problem force it is rather problematic, it is possible to go other way - to declare the territory the world reserve and take away our workplaces, finances, sources of resources which becomes in a pattern ever less. You, of course, aware of the fact that 82% of all energy on the planet gives by burning of hydrocarbons. The energy received in case of this burning goes on heating of our dwellings, on cooking, hydrocarbons burn down in engines of our cars, airplanes, ships, etc. That is why it is so important for us to be a leader in the field of production and processing of hydrocarbons, it is important in strategic plan, not only for us but also for our descendants. Fact: Norway takes the 2nd place in a pattern on gas export (after Russia) and the 6th on oil export. Unfortunately, I am not an expert in the field of oil and gas production, but even tome is clear that as Norway is actively working in the field of increase in gas exports, introduces new gas conduits, it is unprofitable, due to its exit from the "inconvenient" for it Shtokman project to appear a competitor, who will press it in this market. 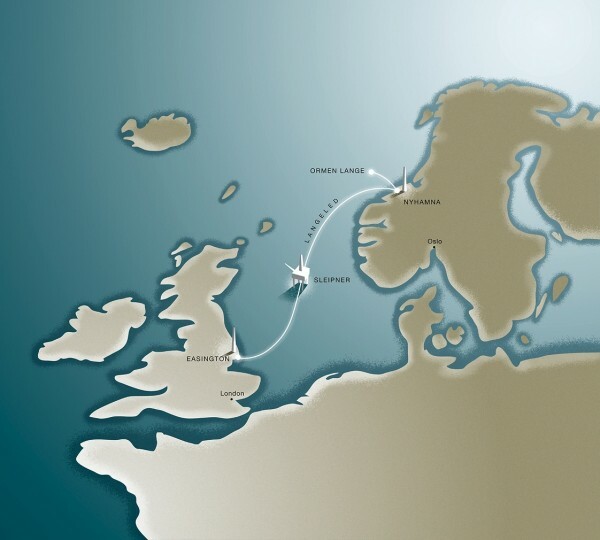 Fact: The longest underwater gas conduit in the world is the gas conduit, connected Norway and Great Britain. By the way, why Greenpeace does not to speak at the September meeting of the UNO General Assembly with a proposal to close half of the Norwegian platforms? After all the possible environmental disasters can so bad affect on the environment, and the remained half would be enough for its comfortable existence. The link to this article after its publication, I will send by e-mail to the Russian representation office of Greenpeace from which I would like to receive detailed responses to those questions that were made in the material. Endodontist in Washington DC endodontic associates of greater Washington.